Teen Idol – the term is ambiguous. Does the term mean the idol in question is a teenager, or someone widely admired by teenagers? According to several reputable sources, the term “teen idol” was first used by Life magazine in its 1 December 1958 issue—to refer to Ricky Nelson, at the time eighteen years old. So I’ve come to the conclusion that for someone actually to be a legitimate “teen idol,” he or she must be a teenager idolized by other teenagers. Hence Elvis was never a teen idol, because by the time he burst onto the national (as opposed to regional) stage in January 1956, he was already twenty-one years old. Tommy Sands may also be considered as having been a teen idol, although his reign was very short, because seven months after he became nationally known as a result of the Kraft Television Theatre program, “The Singin’ Idol,” he turned twenty. So indeed, the first true “teen idol” was Ricky Nelson, whose first LP, Ricky, was released in November 1957, at which time Nelson was seventeen years old. Technically, given the fact that his first hit, “I’m Walkin’,” was released in April 1957, he was actually sixteen years old. Thus Fabian, Frankie Avalon, and Bobby Rydell can all be legitimately considered teen idols as well, although I accept the assertion that the encomium was first applied to Ricky Nelson (has to be, as these other figures were only emerging as stars at the time). As for Elvis, he was never formally a teen idol, but there would have been no teen idols without him. Like Moses, he led the way for others, but never participated in the experience himself. 27 January – Season 4: Ep. 16, “The Car Mix-Up,” of The Adventures of Ozzie & Harriet (ABC). Ricky Nelson is 15 years old. 28 January – Elvis’s first national TV appearance on the Dorsey Brothers’ Stage Show (CBS). Elvis is 21 years old (barely). 17 February – Elvis is awarded his first gold record, for Elvis. 1 April – Elvis does a screen test for Paramount. He’s quickly signed to a contract. 8 May – Ricky Nelson turns 16 years old. 22 August – Elvis begins shooting his first movie, Love Me Tender. 16 November – Love Me Tender opens to massive box office. 31 December – The Wall Street Journal reports Elvis’ gross 1956 income near $22 million. 21 January – Elvis begins filming his second movie, Loving You. He is 22 years old. 30 January – Tommy Sands, a Colonel Tom Parker discovery (like Elvis), appears in “The Singin’ Idol” episode of Kraft Television Theatre. He is 19 years old. About a week later, “Teenage Crush” is released as a single and becomes an immediate hit. 10 April – Season 5: Ep. 28, “Ricky, the Drummer,” of The Adventures of Ozzie & Harriet. Also around this date, Ricky Nelson releases the single “I’m Walkin’,” which becomes a hit. 8 May – Ricky Nelson turns 17 years old. 13 May – Elvis begins his third movie, Jailhouse Rock. 27 August – Tommy Sands turns 20 years old—no longer a teenager. 2 October – First episode of Season 6 of The Adventures of Ozzie & Harriet. ca. 1 November – Ricky, Ricky Nelson’s first LP, is released. 21 February – Tommy Sands’ Sing Boy Sing, loosely based on Elvis’s story, opens. 8 May – Ricky Nelson turns 18. 2 July – King Creole, Elvis’s fourth film, opens. Ricky Nelson, Ricky Nelson’s second LP, is released about this time. 4 August – Billboard introduces the Hot 100 chart. Ricky Nelson’s “Poor Little Fool” becomes the first song to earn the No. 1 position on that chart. 1 October – Elvis arrives in Bremerhaven, West Germany. He will be stationed in the town of Friedburg for the next year and a half. 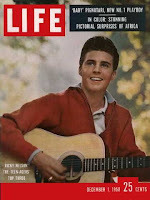 1 December – Ricky Nelson appears on the cover of Life magazine and is billed as “The Teen-Agers Top Throb” on the cover. In the article, he is referred to as a “teen idol” - a teen idolized by other teens.